Email Parser can handle email attachments via the attachment saving action. This example shows how email attachments are saved to a folder for their later use. 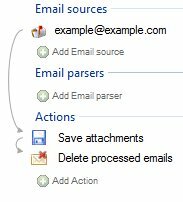 As emails with attachments take a lot of space in the inbox, Email Parser also deletes the email from the POP server using a Delete email from source action.